Technology advancements are expected to continue to drive down the cost of wind energy, according to a survey of the world's foremost wind power experts led by Lawrence Berkeley National Laboratory (Berkeley Lab). Experts anticipate cost reductions of 24%-30% by 2030 and 35%-41% by 2050, under a median or 'best guess' scenario, driven by bigger and more efficient turbines, lower capital and operating costs, and other advancements (see Figure 1). The findings are described in an article in the journal Nature Energy. The study was led by Ryan Wiser, a senior scientist at Berkeley Lab, and included contributions from other staff from Berkeley Lab, the National Renewable Energy Laboratory, University of Massachusetts, and participants in the International Energy Agency Wind (IEA) Wind Technology Collaboration Programme Task 26. "Wind energy costs have declined dramatically in recent years, leading to substantial growth in deployment. But we wanted to know about the prospects for continued technology advancements and cost reductions," said Wiser. "Our 'expert elicitation' survey complements other methods for evaluating cost-reduction potential by shedding light on how cost reductions might be realized and by clarifying the important uncertainties in these estimates." Under a 'best guess' (or median) scenario, experts anticipate 24%-30% reductions in the levelized cost of energy by 2030 and 35%-41% reductions by 2050 across the three wind applications studied, relative to 2014 baseline values (Figure 1). 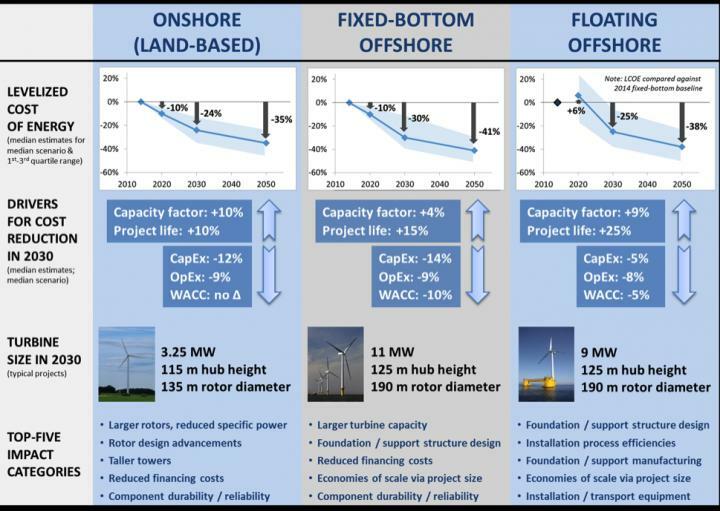 In absolute terms, onshore wind is expected to remain less expensive than offshore, at least for typical projects--and fixed-bottom offshore wind less expensive than floating wind plants (see Figure 2). 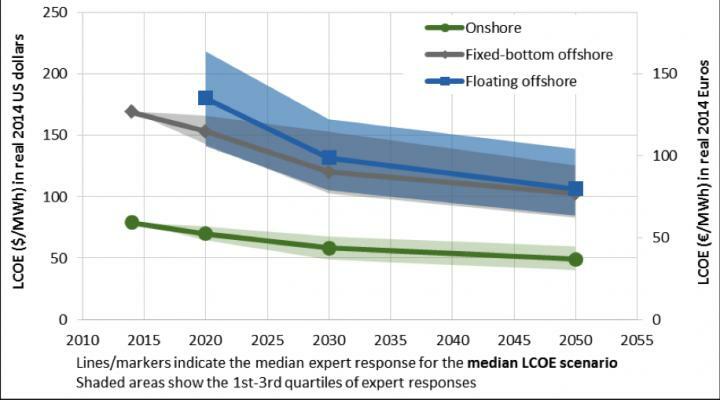 However, there are greater absolute reductions (and more uncertainty) in the levelized cost of energy for offshore wind compared with onshore wind, and a narrowing gap between fixed-bottom and floating offshore wind. There is substantial room for improvement, and costs could be even lower: experts predict a 10% chance that reductions will be more than 40% by 2030 and more than 50% by 2050. Learning with market growth and aggressive R&D are noted as two key factors that might lead to this 'low cost' scenario. At the same time, there is substantial uncertainty in these cost projections, illustrated by the range in expert views and by the 'high cost' scenario in which cost reductions are modest or non-existent. A key change will be in the size of wind turbines, according to experts (Figure 1). For onshore wind, growth is expected not only in generator ratings (to 3.25 MW on average in 2030) but also in two factors that increase capacity factors--rotor diameters (135 meters in 2030) and hub heights (115 meters in 2030). Fixed-bottom offshore wind turbines are expected to get even bigger, to 11 MW on average in 2030, helping to reduce up-front installed costs. A wide array of other advancement opportunities were also identified, with the top-five impact categories for each wind application listed in Figure 1. "Onshore wind technology is fairly mature, but further advancements are on the horizon--and not only in reduced up-front costs," says Wiser. "Experts anticipate a wide range of advancements that will increase project performance, extend project design lives, and lower operational expenses. Offshore wind has even-greater opportunities for cost reduction, though there are larger uncertainties in the degree of that reduction." 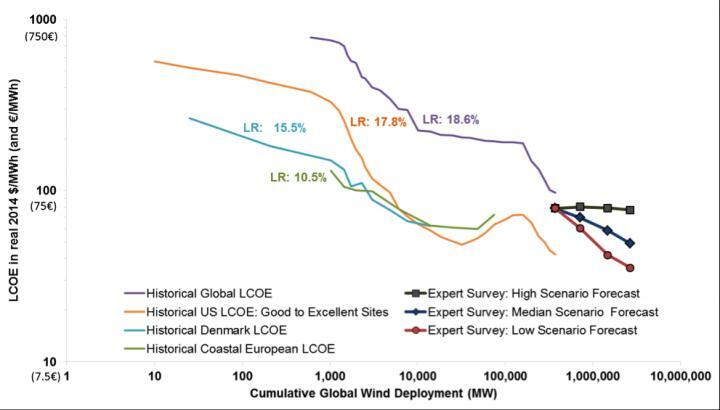 "Though expert surveys are not without weaknesses, these results can inform policy discussions, R&D decisions, and industry strategy development while improving the representation of wind energy in energy-sector and integrated-assessment models," concludes Wiser.